Looks like a perfect set up Bill. Thanks for sharing how you have it all set up. That old laptop on the adjustable stand is pretty useful too. The stand keeps it up above the bench and you can adjust it to any angle or position needed. 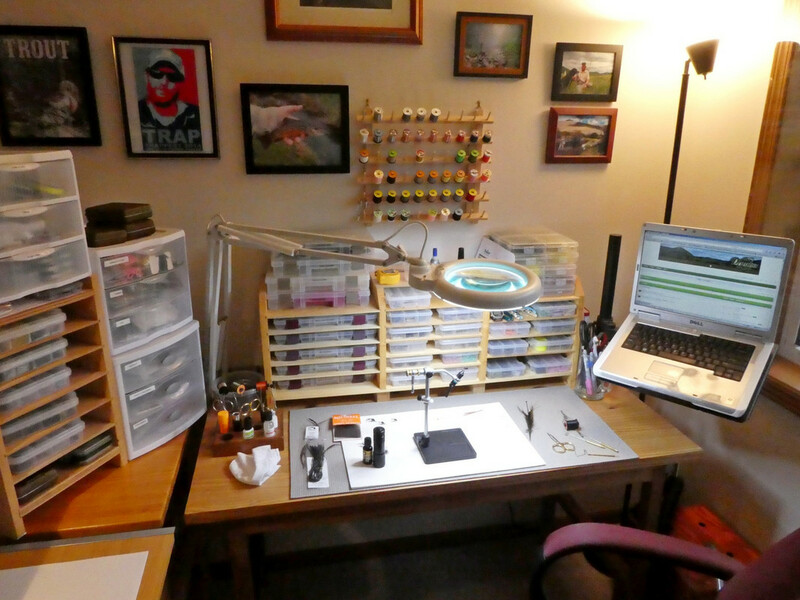 It's nice to follow along with fly tying videos on YouTube, and have the game on or play some music in the background. When I don't need the computer, I can push it off the side out of the way. Next to the Magnifier Lamp, it's one of the handiest things I've bought for the bench. Here's where I daydream. I think Gus my setter is having his own. Picked up the wall mounted thread rack at a local craft store for only $6. The white foam craft mat under the vice are less than a dollar. They really help make a good visual background, and can be tossed when they get too buggered up. The trusty old Dell laptop is mounted on an arm mount so it can be swung out to the way or re-positioned as needed. Handy for following along on YouTube fly tying patterns, or listening to Badger hockey games. The homemade tool caddy can be moved around where needed and keeps all the important stuff in one place. The DayLight Magnifier Lamp is a must have with my poor eyes. I simply couldn't tie flies without it. Best money I've ever spent and useful for many more things than just tying flies. I've hidden a small utility vacuum in a vented wood box under the bench connected to a small hose that I can use to clean up debris on the bench or the floor. Wired it to a handy switch on the side of the bench to allow for quick and easy clean ups. No more bits of feathers or dubbing floating around the apartment. Various size plastic boxes store most of my tying materials. Larger stuff in the 3 drawer bins on the left. I picked up a variety of plastic boxes at American Science and Surplus store in Milwaukee for cheap. Fleet Farm often have Plano utility boxes for sale too. I've rebuilt the benchtop storage cubby several times to accommodate the growing stack of boxes. A bit of overkill I guess. But half the fun has been putting this workspace together and figuring out the organization. Nice to have a dedicated place to work and store all my stuff. Is that a weighted vice? Do you like it? I thought of getting one as my current one is starting to get worn out. Not sure what you mean by a weighted vise. Mine is a Renzetti Traveler 2000. A decent, well built, mid-price vise that does a good job with small and large flies that I tie. Regal makes a great vise that I've been coveting for awhile now. I think the in-line design may be easier to use and provide more room for your fingers to apply the materials to the hook. Maybe if my tying skills improve a bit I might upgrade in the future. Here's my corner of the world. My house has a 15' x 21' addition that had a basement, which, truth be told, is about half the reason I wanted to buy the house when we looked at it. It's my office (I work out of my house) so one tiny corner is my work desk, one wall is bookshelves, and the rest is hunting and fishing stuff. Conventional rod racks along one wall, the wall behind me is built-in cabinets, and the floor joists above my head are full of muskie lures. 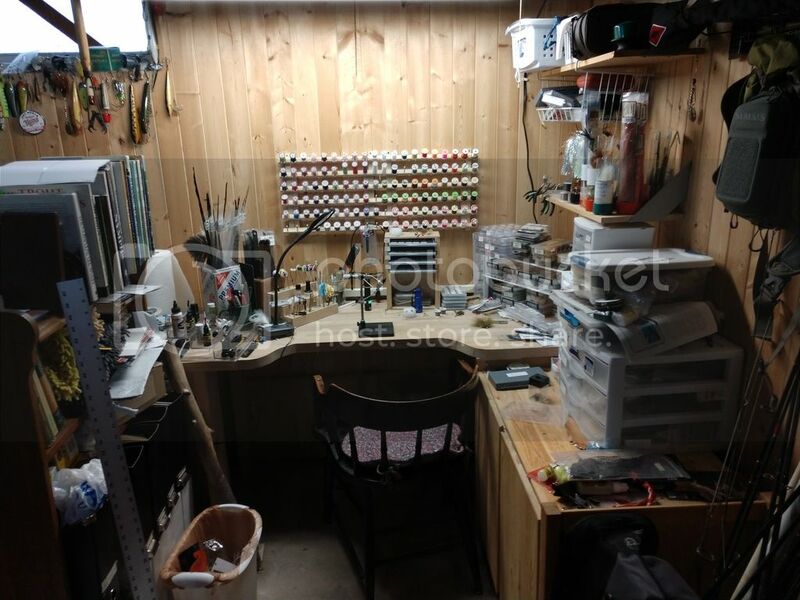 This is the fly tying corner. Left side is a bookshelf with a bunch of fly tying books and other stuff. Cabinet on the right stores a lot of fly fishing gear, plus bulky stuff like deer tails, foam and other stuff in big Plano boxes. After tying for a long time on a wobbly crap workbench made from plywood and 2x4s, I finally built a bench last year. Heavy oak top so it's nice and stable, and plenty of surface area, but not too deep so I can't reach stuff easily. 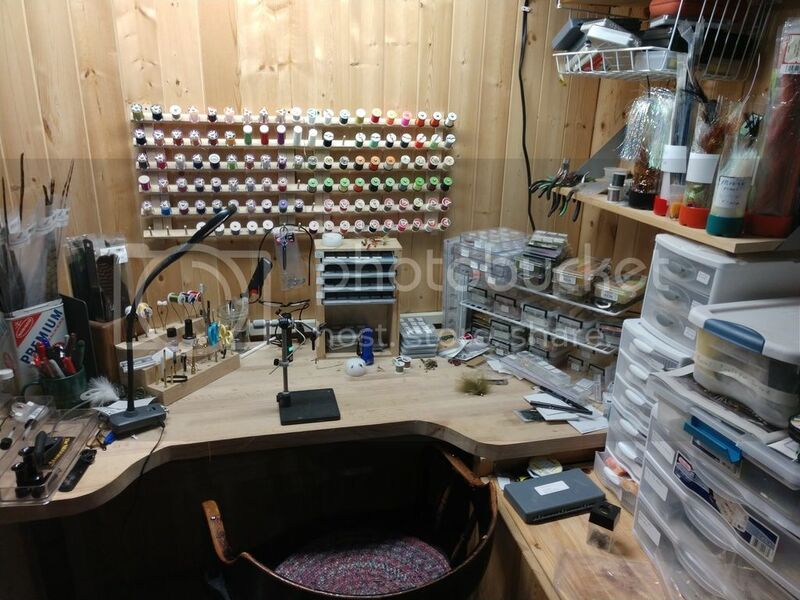 My project for this winter will be building some shelves that wrap from the right side of the bench to just left of center center to store hooks, beads, dubbing and other small misc. stuff. I'm currently agonizing over how I'm going to configure it. I have the same vice. Like it a lot. Had a Peak which was also a solid vice. 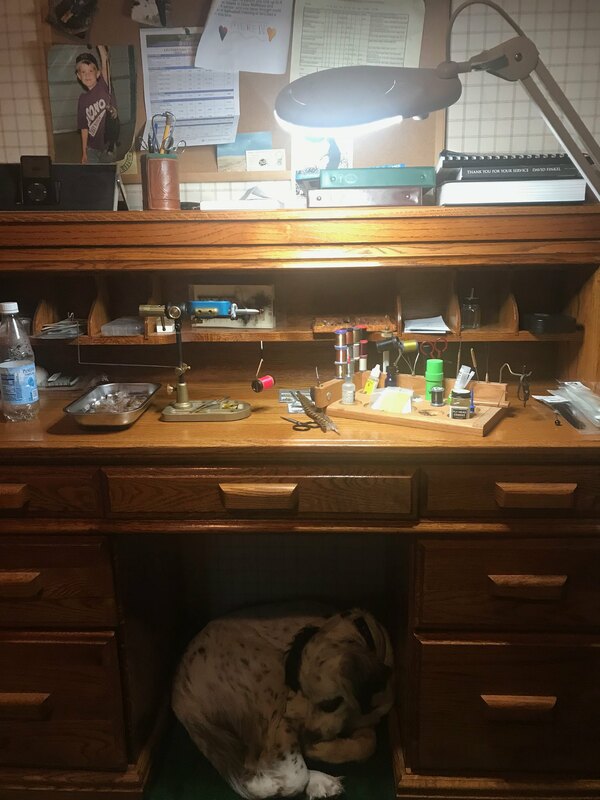 But my daughter wanted to take some fly tying stuff with her to college, so that seemed like a good excuse to go get a new vice - she took the Peak, I got the Traveler. Personally, I really like pedestal base vices over c-clamps. Can move it around easier, and they're really stable. When I'm on a boring conference call for work, I'll pick mine up, move it to my work desk and tie while I listen in on the call. Had to restock my stream box last night as the rocks have eaten well over my past few trips. 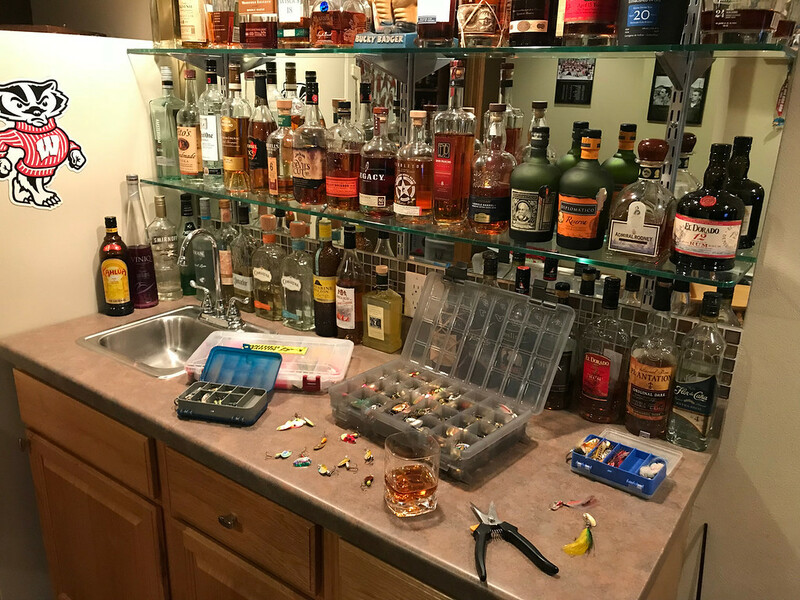 I usually use the wet bar counter when I putz with my fishing stuff although in the summer I use the back deck. Honestly... I can only imagine how far off the deep end I'd go if I ever actually take up fly fishing and tying. Some of your setups are really cool. Yep, that would be the one. Thanks!